The most important element in any relationship is your ability to not only care, but show you care in ways that meaningful to those for whom you care. Pretty straightforward, right? Employee engagement reflects the care of a company's leadership and management for its employees and how well they can communicate that to their employees, again, in ways that are meaningful to them. This short ebook offers 13 ways to show your employees you care about them. Each of these ways are ways that would be meaningful to them. How can I say that? I've used them to grow a company here in the U.S. and to grow an overseas division. They have stood the test of time and geography, cultures and language. In addition there quotes to inspire you and exercises to strengthen your muscles of caring and recognition, making it a daily habit. I led a small company, post-911, through two economic downturns, and an industry whose prices fell by more than 70%, reaching 80% revenue growth while keeping cash-flows positive during this same time period. We were able to reach these goals by creating an engaged employee group, topgrading each employee to insure we had A+ players, creating a single-minded focus on creating customer evangelists. Before that I opened an overseas office for a US telecom provider. 6 months later we had tripled our new orders and doubled our revenues. I host a radio show focusing on leadership, innovation, customer service, employee engagement ... all the things that help a company survive. I share higlights from each guest's wisdom, solutions, and resources. You can read them here. 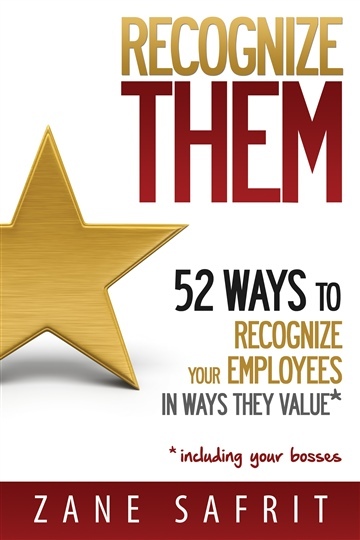 My book, Recognize THEM: 52 Ways to Recognize Your Employees In Ways They Value is available. Readers keep sharing good reviews. I wrote guest posts for Small Business Trends organized by Anita Campbell and as the title says focuses on Small Business Trends and AMEX Open Forum. My first post there was titled Small Business: Tear Down Those Walls. I'm always happy to discuss solutions and challenges with business, startups, hiring, motivating, the use of social media to create engaged employees and customer evangelists. I'd be happy to discuss how we could work together to bring my expertise from my experience and help you reach your goals faster.